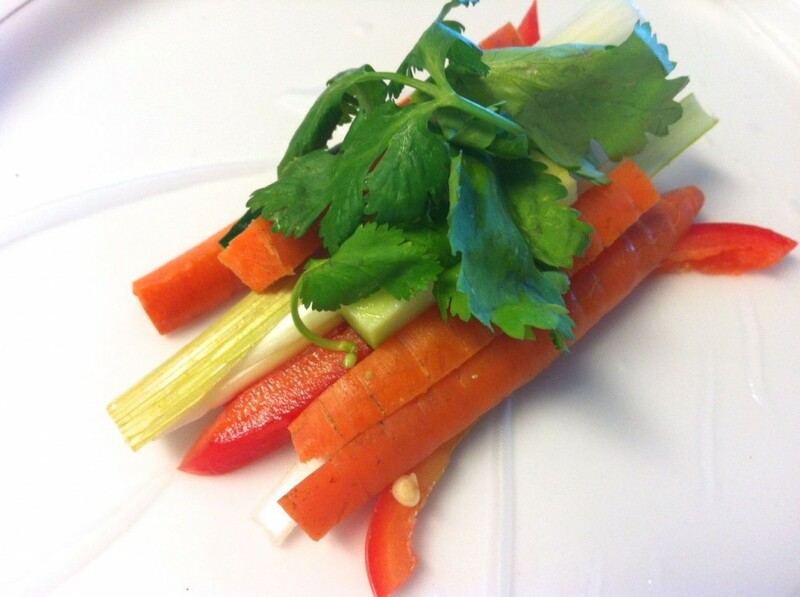 I'm personally always looking for creative ways to incorporate more raw foods into my diet other than salads. While dreaming up new ways to do just this, I created these wraps with ingredients I know go together joyously well for the dip. I hope you love them as much as I do. The spring is a wonderful time of year to eat lighter as our bodies naturally crave more raw foods. At least in this part of the world where the days are finally getting longer (hurray!) and the air is slowly but surely getting warmer. However, even my joyous readers in Australia will surely enjoy this recipe because the almond sauce is comforting and precisely what makes these light wraps meal-worthy. Super easy preparation. Talk about fast-healthy-food! Eating more vegetables is a quick and easy way to get more nutrient-dense and fibre-rich foods into your belly. Better skin: Glowing, hydrated, healthier looking skin. Less prone to excessive oil and dryness. Improved digestion: Improvement in elimination - better bowel quality movements. Now of course there are many foods that when cooked are more beneficial nutritionally, such as is the case with tomatoes as tomato paste is higher in lycopene. However, you really can't go wrong with eating more raw and variety is the spice of life! Mix up your diet with both raw and cooked. Caution: If you have inflammation in your gut, you need to be careful with a lot of raw foods and roughage can be damaging to your delicate intestinal lining. Also, if you currently eat a lot of cooked and processed foods, introduce raw foods slowly so that your gut can get used to the increase in fibre. Let's get right to this delicious recipe! I had some as an appetizer before dinner and then again for lunch - yummy! 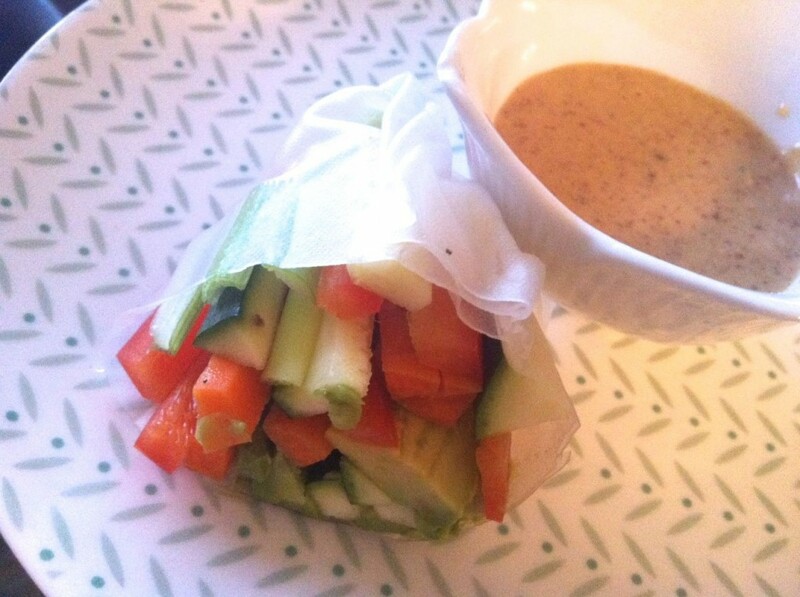 4-6 Rice paper wraps (Buy from Chinatown or a health food store -- the fewer ingredients, the better). Alternatively you could use a collard green. 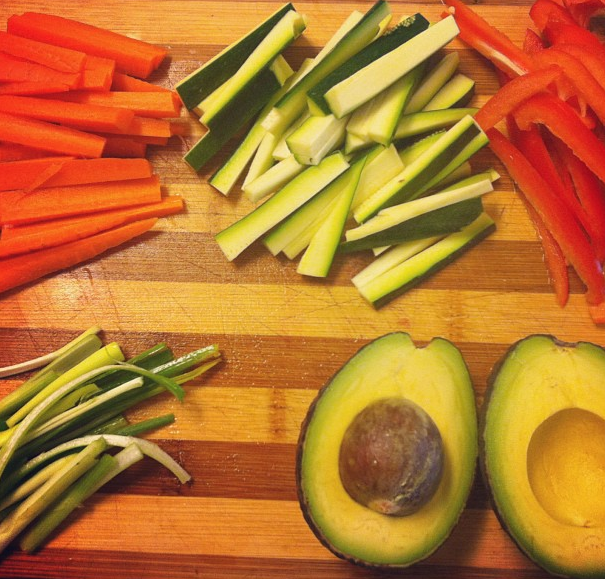 Thinly slice (julienne) red pepper, zucchini, carrots, spring onions, avocado. Roughly chop cilantro. Boil filtered water. Pour water into a large baking dish about a 1/4 inch deep. This is the water to dip your rice wraps into. Follow the instructions on the package to make rice paper wraps pliable. Place wrap on a plate and assemble wraps per photo. Roll/fold together like a tortilla wrap by folding up the bottom, rolling and folding the top. Easy peasy! Place all the ingredients for the dip into a food processor or blender and combine until smooth. Give it a taste test. When I made this sauce, I didn't measure anything, so I'm doing my best to give you a basic idea of proportions. However, you can't really go wrong with these ingredients! For more clean eating recipes like this, join our online Eat Clean Body Lean program now. It's available until May 31st and once you've got the ebook, you can do it anytime! 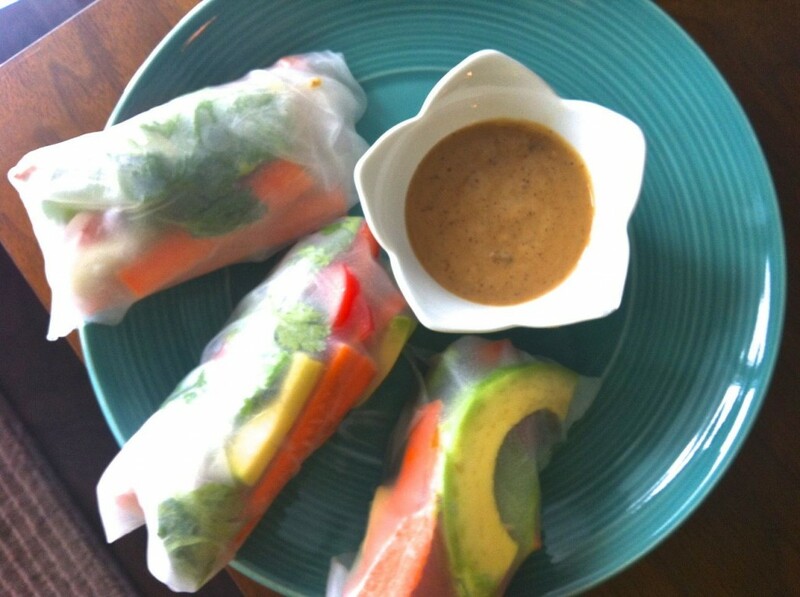 Love spring rolls! Wrapping the veggies first in lettuce (butter or romaine work well) then in the rice wrapper also keeps the veggies together a bit better. Adding in mango slices or asian pear slices really adds a nice sweetness. Also, Wholefoods now carries brown rice paper wraps. Sounds delicious with fresh mint and basil! This looks amazing,it reminds me of a meal I got at Rawlicious. One question, how do you use collard green as wraps? I tried steaming them lightly once before using and raw and they didnt come out as good as they do at health food restaurants. Hi Victoria! Collard greens are really nice wraps. You score the stem lightly with a sharp knife so it rolls easier and then wrap! You eat them raw. Okay great, thanks for replying. Its very nice of you to respond so often to all the questions you get here and on facebook, etc. Yumm! I have made these often but have not yet found a perfect dip. I'm very eager to try out your recipe. Also, I love bean sprouts and mango slices in my wraps too. Mmmmm! Thank you for the recipe! What about adding some tempeh strips for more protein? This was absolutely delicious! Thanks! Love all your recipes. Thanks Joy! Another awesome recipe that took 10 minutes to make. ?